Well, Adam did not have a very productive night. In fact, he turned his chair for only one artist last night, and he lost her to Blake. The talent was rather good last night, but Adam just didn't hear what he wanted to add to his already stellar team. Some may say he's being picky... I say he's being selective to find those singers that he will be best able to help achieve their dreams. Isn't that what the show's about? Usher filled two more slots on his team. First to join was Morgan Wallen after singing “Collide.” Morgan's been singing for most of his life, but he has had no experience in the professional music industry. His uniquely deep and rusty voice turned Shakira's chair as well, and while Morgan does need some fine-tuning, I think Usher was the right choice to help him hone his obvious skills. Stevie Jo came on with “There Goes My Baby” which peaked Usher's attention only. Stevie grew up with Heavy Metal but has since migrated to a more R&B/Soul vibe. I think Adam and Blake were going to turn, but with Stevie doing an Usher song, they figured they'd have no chance of winning him over. Shakira added three artists to her roster. She won over Emily B. after hearing her take on “Wicked Game.” Emily's voice had a very soft and smooth element to it, but she still showed how controlled and powerful she can be. Blake and Usher also vied for Emily, but she chose Shakira. Personally, I think she would have been better off with Usher. Also joining Shakira was Dani Moz (“I Need You Love”) and Music Box (“You Gotta Be”). Both were single chair turns and didn't really get much exposure. So, we'll have to wait a while before seeing how well they will fair. Last night, I think it was Blake that scored the biggest talent. 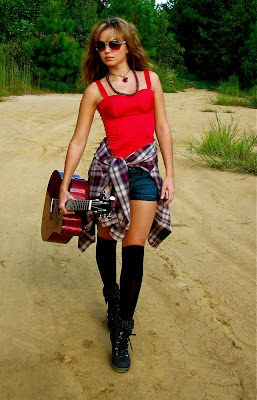 First off, Megan Rüger hit the stage with “Just Like A Pill.” A rocker girl living in Nashville, and she proved to us that not everything from Nashville needs to be country. She had an amazing look, and her personality lit up the stage. Her pure rock tone and great energy only turned two chairs (which baffles me), and Blake and Usher even waited until the last moment before turning... really not sure what was going through their heads... Megan, in my opinion was one of the two best of the night. Blake also picked up Lexi Luca (“Wasting All These Tears”), but we didn't get to see much of Lexi's performance. Audra McLaughlin was the other contestant that I would put up as one of the best. Her rendition of “Angel From Montgomery” was good enough to turn all four chairs. Her power and control was mind-blowing, but more importantly, she conveyed the emotion of the song in a way few artists can. After the usual back-and-forth among the coaches, Audra picked Blake... though I think Adam may have been the better choice. So, Blake was finally able to add two very strong and highly talented performers to his team. Usher and Shakira added some unique sounds to their rosters, and Adam got no one. Adam is obviously looking for something very specific... will he find it? Watch next Monday and Tuesday 8/7c on NBC to find out. With the teams now filling fast, the remaining contestants are going to have to bring their all to turn a chair.